Americans think they have a special relationship to theme restaurants. After all, we are the culture which gives the world (or at least its tourists) such jems as Johnny Rockets (I wanna relive the fifties! Do I get race riots with that?) and Rainforest Cafe (I've always wondered if they regularly slash & burn their food). And people love these things. How many travelers will eat at a Bubba Gump Shrimp Company place while on vacation instead of hitting some hip local joint? How many people dream of having Hard Rock Cafe shirts from every country? Well, folks, America has officially been one-upped. In Taiwan, some crafty businessmen run a chain called (no lie) Modern Toilet. 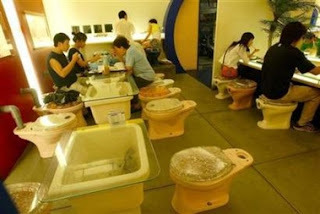 It is a theme restaurant that's centered around...you guessed it...toilets. Toilet food bowls, toilet seats, toilet paper for napkins. Personally, I'm relieved to find out that there are weirder people than us out there. However, the zenith of this concept would be if either Denny's or Taco Bell did a toilet theme. It would, seeing the quality of their respective food, be a natural fit. At any rate, it would at least speed up the process of eating their crap. Every pun here was intended, by the way. ugh, Denny's should have a toilet theme! that's where I inevitably end up shortly after eating there.